Preheat oven to 350 degrees. Combine all ingredients. Pour into prepared loaf pans or muffin tins. Sprinkle bee pollen over the batter, if desired. Bake for about an hour, or until a toothpick inserted in the center emerges clean. Cool for 10 minutes, then invert onto a rack to cool completely. I decided to go all green when I cooked my Lotus Foods organic jade pearl rice. 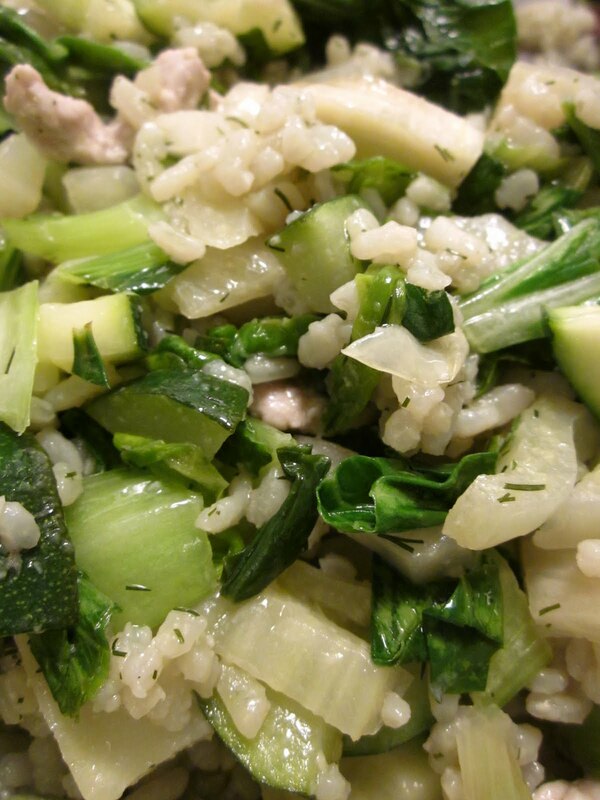 So while the rice steamed in one pot, I sauteed minced garlic, slices of fennel, zucchini coins, and chopped bok choy in a splash of olive oil. When the rice was cooked, I gently incorporated it into my green veggies and seasoned it all with minced fresh dill and fresh tarragon. What a tasty - and green! - sidedish. And because I was always taught to have a minimum of three colors on a plate, I served this with chicken sausages, bright purple kimchi, and roasted golden beets. Another dinner, another funky grain. 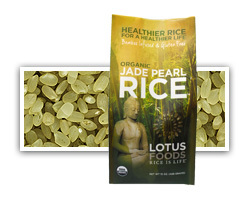 I came across this rice at the store and couldn't resist: organic bamboo-infused jade pearl rice. Green rice! Click here to read more about this interesting grain by Lotus Foods. I like that it's high in chlorophyll. If you're local, I picked up my bag at Earthbound Farm's Organic Farmstand. I'm not sure how many changes you can make to a recipe and still have it be called by the original name. 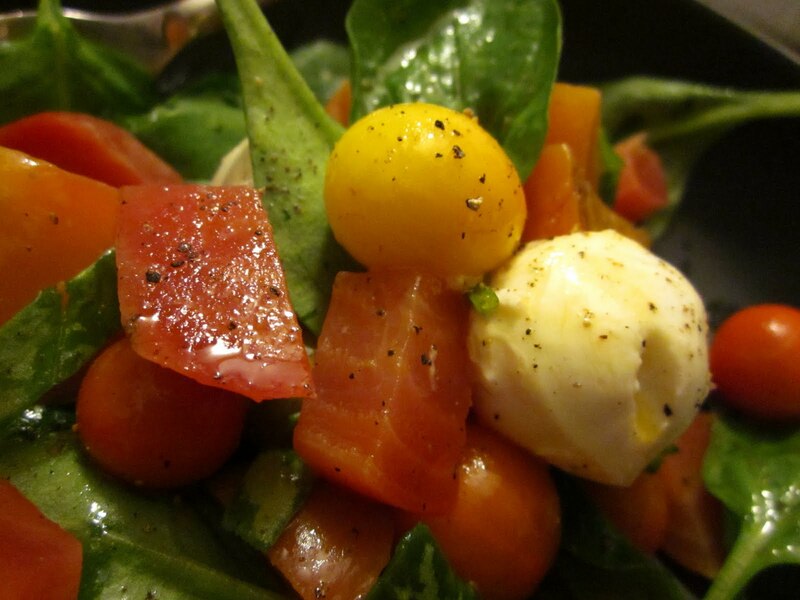 Insalata Caprese is traditionally buffalo mozzarella, tomatoes, and fresh basil, all dressed simply with olive oil. I had some fresh ciliegia ("cherry") mozzarella and the sweetest cherry tomatoes I've ever had. Then I tossed in some slices of the roasted chioggia beets, baby spinach, and fresh tarragon leaves. I added splashes of white balsamic vinegar and olive oil and sprinkled everything with pink Himalaya salt and freshly ground pepper. Thanks to Belle - and Randy! - for the beets and tomatoes. 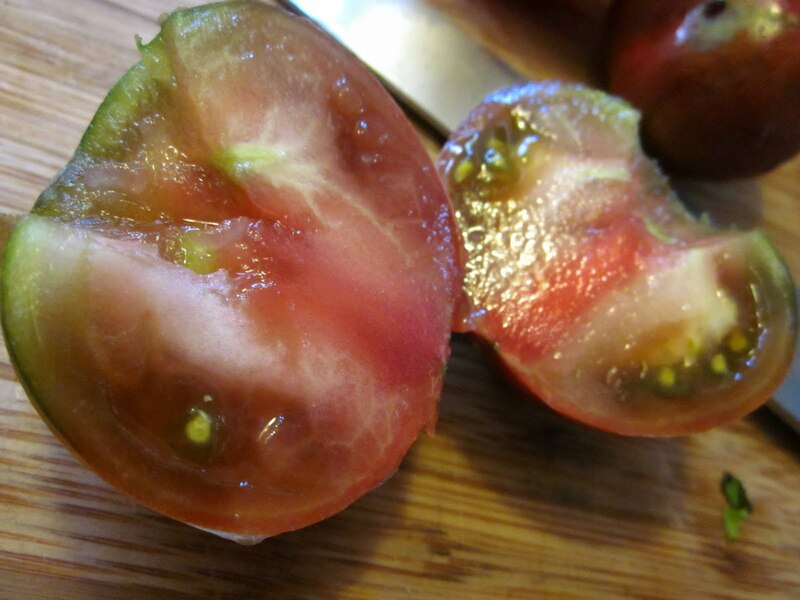 I have never had tomatoes this sweet before...at least not on this continent. Seriously, these rival the tastiest tomatoes I had in Italy. Squisito! Touted by Sunset Magazine as one of the top 10 feel good foods, chioggia beets are my family's favorites. 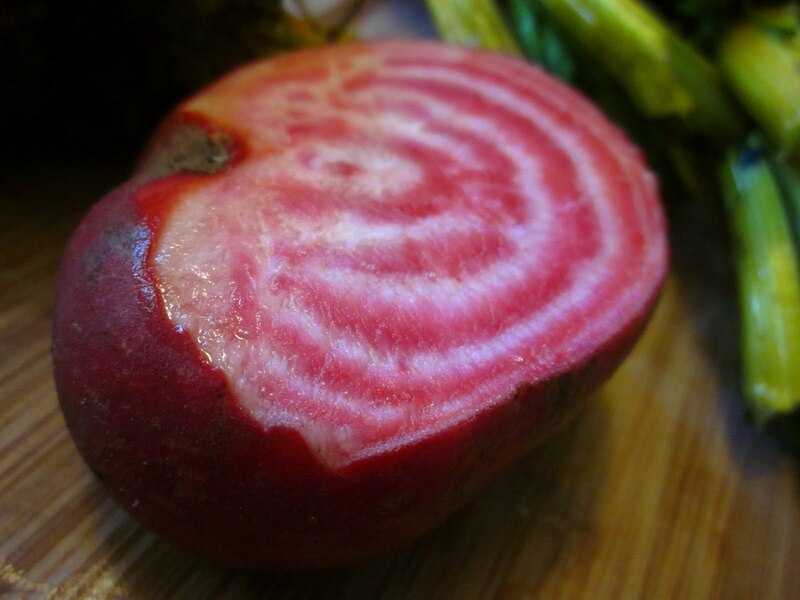 Though the boys gobble up both red and golden beets, what they call "the candy cane beets" are especially beloved. These beauties came to me from my friend's garden. Thanks, Belle! For a colorful salad that's rife with potassium, iron, and folic acid, roast your beets, slice them, then dress them with a splash of olive oil, a dash of balsamic vinegar, and a sprinkling of salt and pepper. 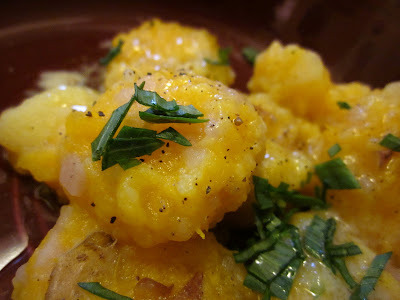 With some leftover pumpkin puree in my fridge and some potatoes from my High Ground Organics CSA box, I decided to make a pumpkin-potato gnocchi for dinner. Most people roll their gnocchi dough into a thick straw and cut the gnocchi; in Italy I was taught to hand-form them, so mine look less uniform. For this batch I used 2 C of pumpkin puree and about 6 small potatoes. Scrub potatoes then towel-dry. Roll them in olive oil, sprinkle with sea salt, and roast in a 350 degree oven until they are fork-tender. Let cool slightly. I leave the skin on the potatoes, but feel free to peel yours if you don't want the added texture. Using a potato masher, begin to smash the potatoes in a large mixing bowl. Mash the pumpkin into the potato mixture and keep mashing. Add two pats of butter, one beaten egg, and mash until smooth. Then mix in flour, slowly, until you get a medium (not stiff, but not too sticky either) dough. Usually I add about 3/4 C by the time I'm done. To highlight the subtle flavor of these gnocchi, I served them simply - with a sprinkling of sea salt, drizzled with olive oil and white balsamic vinegar, topped with some fresh tarragon. One of my cooking rules: use what you have. Sure, there are times when I will run out to the store for a specific ingredient, but after a long week of work, I just want to get dinner on the table to join the boys for family fun, scouring the cupboards and making it work. Tonight I had farro in the cabinet, chicken-spinach-feta sausages in the fridge, roasted pumpkin from Belle, zucchini, summer squash, carrots, and thyme from my High Ground Organics CSA box, and, well, I always have garlic and saffron. Maybe I've read one too many Dr. Seuss books, but I dig alliteration. So, I decided to call this risotto-style dish Farro con Zucco e Zafferano. 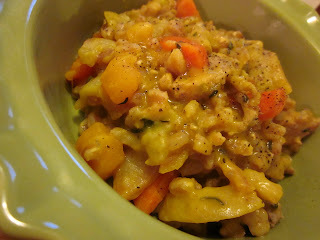 Farro with Pumpkin and Saffron. I brought water to a boil, removed the pot from the flame, then dropped a few saffron threads to infuse for 10 minutes. Then I brought the saffron-infused water to a boil again and boiled the grains for 10 minutes. When I drained the farro I reserved the saffron cooking water. In the meantime, I sliced and cooked the sausages with minced garlic. Then I added the carrots followed by the zucchini and summer squash. Finally I added the drained farro and cubed, cooked pumpkin. I poured in the saffron-cooking liquid till everything was covered and brought it to a boil. I covered the pot and reduced it to a simmer, cooking until all of the liquid was absorbed - about 20 minutes. Once the liquid was gone and the farro tender, I stirred in some marscarpone cream and seasoned with fresh, minced thyme, pink Himalaya salt, and fresh ground pepper. I started buying and cooking farro when I lived in Rome. I have always thought it was barley; it looks like barley. But when Riley asked me what it was tonight, I decided that I should look it up just to be precise. Farro (Triticum dioccum) is an ancient wheat while Triticum spelta is spelt. Turns out...it's not barley. Whatever it is, we're calling it dinner. 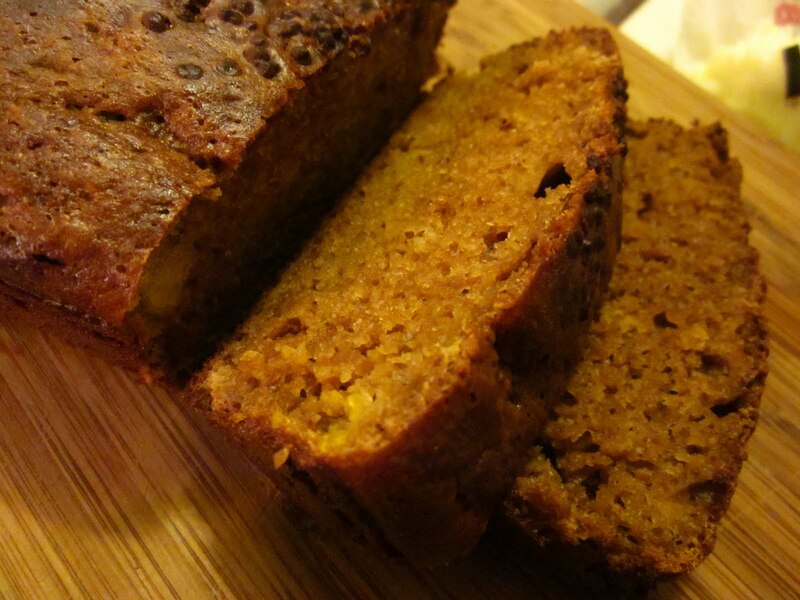 There was no real reason for adding bee pollen a loaf of banana bread. I just saw the bag of pollen in my cupboard and thought it would make an interesting addition. So I threw in some raw honey to stick with the bee theme. Preheat oven to 375 degrees. Whisk together all wet ingredients. Mix all dry ingredients. Mix until just moistened. Spoon into a prepared pan. Bake until golden brown (approximately an hour) and a toothpick inserted in the middle comes out clean. Cool in pan for 10 minutes. Then invert onto a wire rack and cool completely. I sent some cabbage dishes to my previously cabbage-phobic friend with a note that I required photographic evidence that he took at least one bite of each dish. And, as I suspected he would, he posted a well-done video of his foray into cabbage consumption. I just wasn't sure of the verdict. 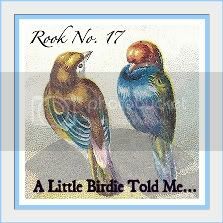 I was very pleased to see him not only take mulitple bites of each - gallo pinto-stuffed cabbage rolls and kimchi - but to declare that it was tasty. Wow. YOU did it! 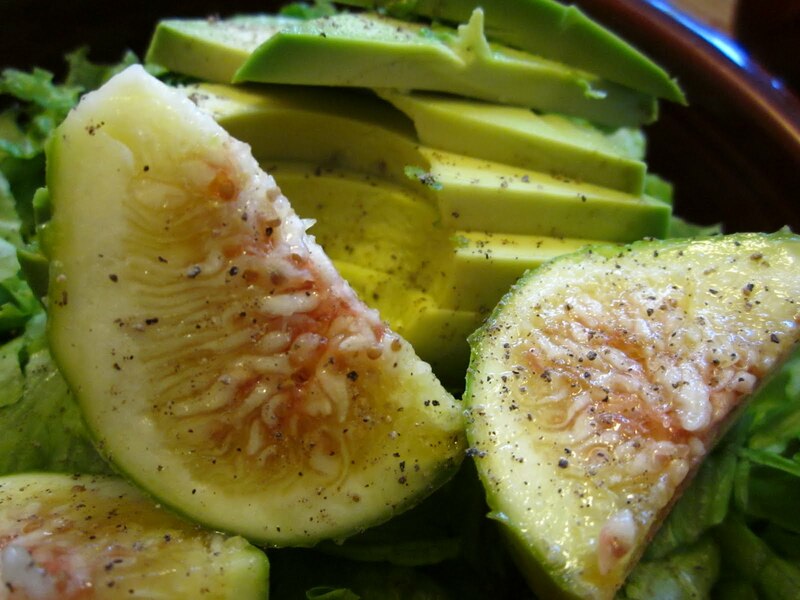 This salad is the perfect end to a summer's dinner: greens topped with slices of ripe avocado and fresh green figs, sprinkled with pink Himalaya salt and fresh ground pepper. And I love the squeeze-and-go dressing...juice from a clementine and a good olive oil. So easy. So fresh. So delicious. The combination of a sunny Indian summer evening and some luscious tomatoes from Belle's garden meant one thing for dinner: caprese pasta. This dish reminds me of so many summer dinners at my apartment in Trastevere. I love that the only thing you have to cook is the pasta. While the pasta boiled, I sliced a ball of fresh mozzarella and fresh tomatoes. 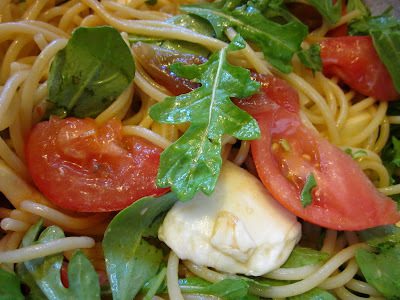 Then when the pasta was done - al dente!- I tossed it with the cheese, tomatoes, and a handful of arugula leaves. A splash of olive oil to make everything glossy; fresh ground pepper and some grey sea salt for some more flavor. Che squisito! And so, so fast. Last year for Thanksgiving, I cooked a Native American feast and called it: How the Other Half Ate. 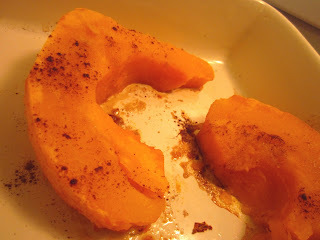 One of the side dishes I made was a baked pumpkin from the Ojibwa tribe in Canada. And since Belle had given me a gorgeous, voluptuous pumpkin yesterday, I baked it last night. Three-quarters of the baked pumpkin I turned into puree for future pumpkin treats. And a quarter of it I put back in the oven this morning for breakfast. Slice the pumpkin into wedges. Smear a bit of butter on the pumpkin or drizzle it with oil. Sprinkle with brown sugar and spices. This morning I used ground cinnamon and ground nutmeg. Bake till the pumpkin begins to brown. I served this with some plain yogurt, granola, raspberries, green figs, mint tea and called it breakfast. 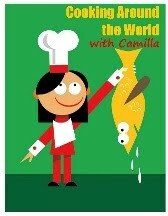 I recently joined the Secret Recipe Club - organized by the amazing Amanda - and received my assignment for next month. Though I am not tipping my hand as to whose blog I have, I have been excitedly perusing her recipes, trying to decide what I'll make. The basic idea: you get a blog assigned to you, you pick one of their recipes, make it, then blog about it on your assigned 'reveal date.' It's a great way to discover other kitchen blogs, experiment with some new recipes, and have some fun. Keep your eyes out for my Secret Recipe Club reveal on September 12th! My fermented cabbage, Korean-style is finally done. So I served it tonight with steamed brown rice and marinated beef. My husband doesn't usually like kimchi. But he actually went back for three helpings this evening. Success. If you've been following me for awhile, you'll know that one of my missions in life is to challenge people's palettes, specifically, if a friend tells me "I don't eat _____________." _____________ is exactly what I'm going to make for them. So, when a friend told me that cabbage + anything = scary, I decided to make a couple of things for him, with the proviso that he only needs to eat one bite, but that I require photographic evidence of him trying the dish. 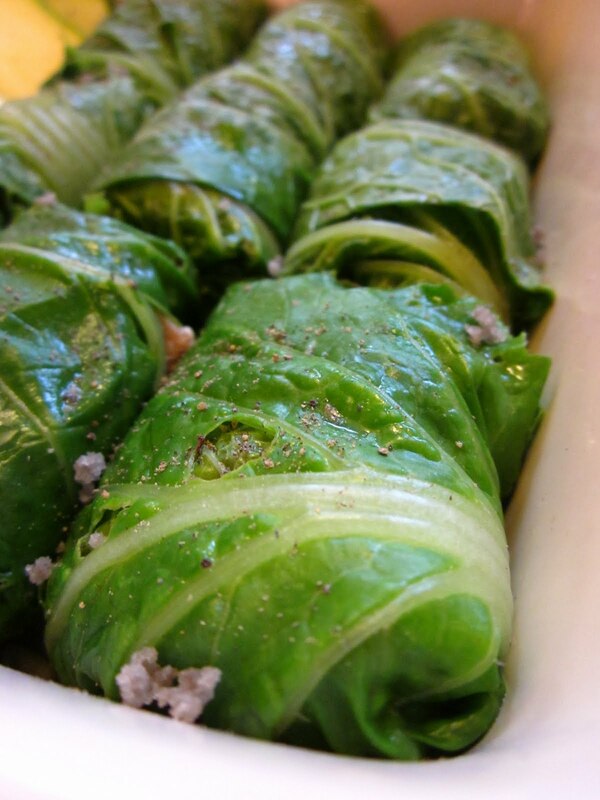 First up: gallo-pinto stuffed cabbage rolls. I figured that sorma, Serbian cabbage rolls stuffed with meat and sauerkraut, was probably too much cabbage for my cabbage-phobic friend. To support my effort, another friend donated some bounty from her garden in the form of two heads of cabbage. I had some leftover gallo pinto. I added diced cooked chicken sausages, 2 beaten eggs, and a cup of shredded cheese. 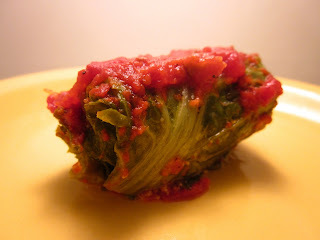 Then I blanched some cabbage leaves, stuffed them with the mixture, rolled them into tight packet, covered them with tomato sauce, and drizzled them with olive oil. I baked them until the sauce was bubbling, about one hour. These will be delivered to Seca Place tomorrow. I'll post his verdict later. When my friend Belle brought me three pumpkins from her garden this afternoon, I was ecstatic. I know, I know...it's only August. But my pumpkin adventures are beginning anew. I took the biggest one and roasted it tonight. 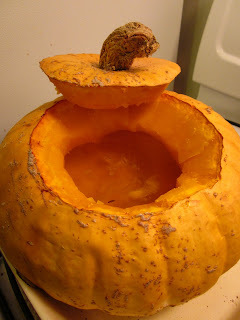 Cut a hole in the top of the pumpkin and scoop out the seeds. Place two orange halves in the cavity and fill the pumpkin half-way with water. Bake in a 350 degree oven for 1-1/2 to 2 hours. Let cool. Now the fun begins. I can scrape the flesh out and make a puree or I can slice it into wedges, drizzle it with ginger syrup and bake it again until the the wedges are brown and caramelized. I haven't quite decided. I do know that I am going to savor every single bite. 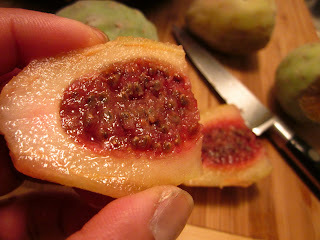 After buying four prickly pears this afternoon, I was searching for culinary inspiration. But after tasting a bite of them raw, it was clear: these must be sweetened somehow. My mouth is still puckered from that single bite. So I decided on jam; I skipped the lemon juice that I usually add to jam because the prickly pear seemed acidic enough. 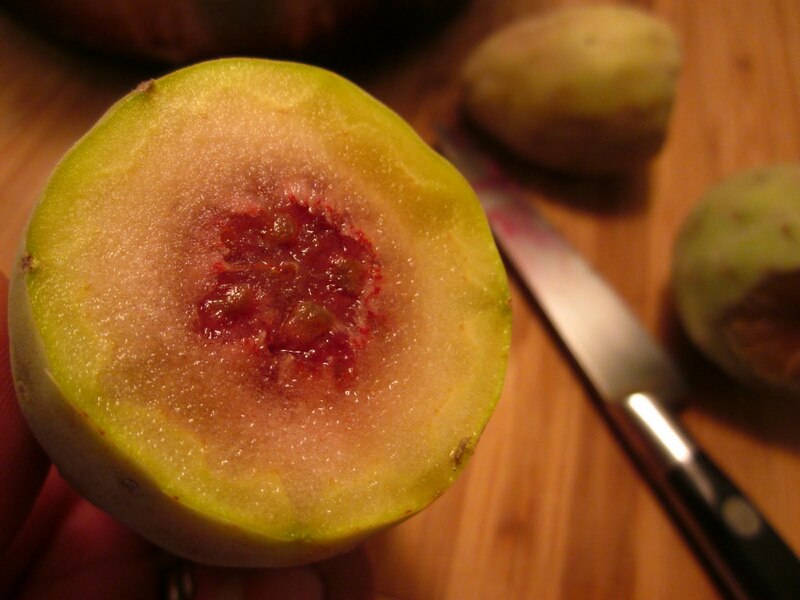 Because the four fruits yielded surprisingly little - after being peeled and deseeded - I filled in with some fresh green figs that I had in my fridge. Toss a couple of star anise into the mix and I have a distinctive jar of jam to serve on toast this week. Delicious! Place the fruit, sugar, and water into a large pot and bring to a boil over medium-high heat. Continue to cook, stirring the jam constantly, for about 15 minutes. Reduce the heat to medium. Hold the jam at a constant simmer, checking frequently to make sure the jam isn’t scorched at the bottom of the pot. After 15 minutes, check to see if your jam has set by running a wooden spoon down the middle of your jam. If the jam leaves a path, it's set. If the liquid runs back to fill the path, cook it a little bit longer. Remove the star anise. 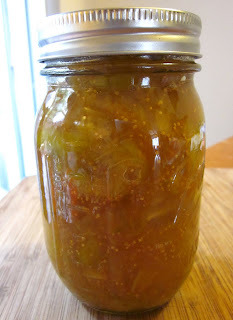 Spoon the jam into sterilized jars, leaving about a 1/2" gap to the top. Gently tap the bottom of each jar on the counter to release any air bubbles. Using a damp clean towel, wipe the rims of the jars and secure the lids and rings. Process in a water bath for 10-15 minutes. Remove the containers with tongs and let cool on the counter. When I stopped at a Mexican market to find a molinillo for the history of chocolate class I'll be teaching later this trimester, I - not surprisingly - wandered excitedly through the produce section before heading to the checkout stand. I found loroco flowers, fresh peppers in every color of the rainbow, but the only thing I grabbed today were prickly pears. I've been curious about them and finally decided to give them a try. These were already "de-spined", but I was still clueless as to how to prepare them. 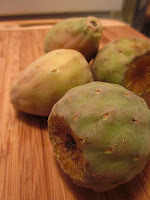 Thankfully I found this useful tutorial: how to cut and prepare prickly pears from simplyrecipes.com. The seeds are vaguely like gravel. Teeth-breaking little buggers. And the fruit itself was very tart. Having never bought prickly pear before, maybe I didn't pick the ripe ones. I peeled, scooped, and chopped and ended up with very little prickly pear. Oh, well. Next time I'll buy more. Then I turned these lovelies into jam. Recipe and photos to follow. Yum! 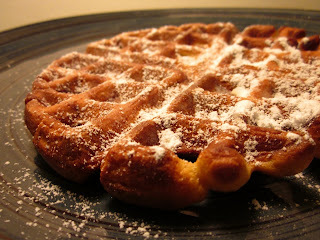 Leftover pumpkin + lazy Sunday morning = pumpkin waffles! Place all the dry ingredients into a mixing bowl. Add the wet ingredients and stir till just moistened. Cook in your waffle-maker according to its directions. 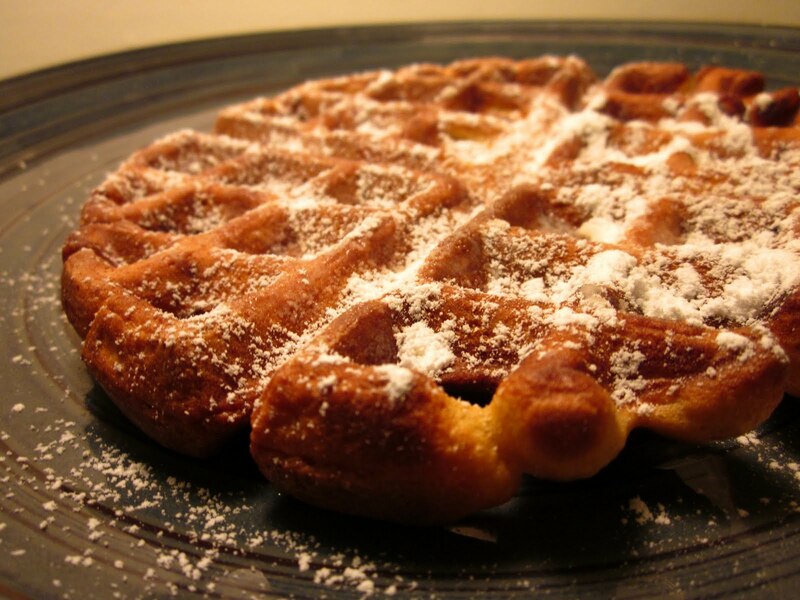 Serve with a dusting of powdered sugar. When I asked the boys what they wanted for dinner, Dylan suggested clam chowder. Riley asked if we were going to the Wharf; Dylan said, "no, I like Mommy's chowder better." Love it. So, naturally, I made it for them. The potatoes and celery were from our CSA box from High Ground Organics. Typically celery just seems like green water in stalk form, crunchy but tasteless; these were so fragrant! 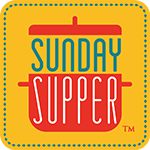 In a large soup kettle or stockpot, cook sausages, celery, and garlic over medium heat. Add potatoes and cook till they beginning to caramelize. Add the clams. In another pot make a roux with the butter and flour. Add the clam juice to make a thick sauce. Transfer the sauce to the larger pot. Stir in chicken stock and cook till desired thickness. Add heavy cream and season with fresh herbs and salt to taste. Serve in a sourdough boule. What to do with some leftover gingersnaps from my Snappy S'mores from last weekend?!? 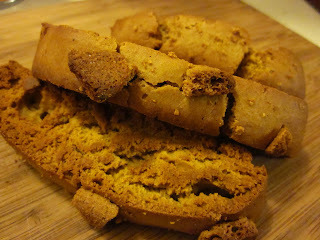 Pumpkin biscotti, of course! Yes, I am lengthening my pumpkin-cooking season. You've been warned. In a large bowl, mix together oil, sugar, eggs, pumpkin puree, molasses and ginger syrup. In another bowl, combine flours, baking powder, and spices; mix into egg mixture to form a stiff dough. Divide dough in half, and shape each half into a roll the length of the cookie sheet. Place rolls on cookie sheet, and pat down to flatten the dough to 1/2 inch thickness. Press crumbled gingersnaps into the top of the loaves. When cool enough to touch, cut into 1/2 inch thick diagonal slices. Place sliced biscotti on cookie sheet, and bake an additional 10 minutes on each side, or until toasted and crispy. 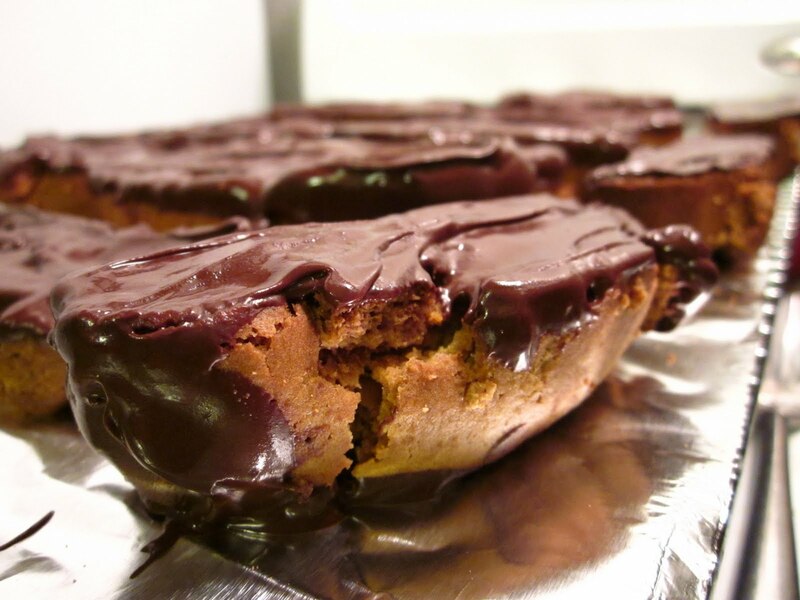 Dip in melted dark chocolate, if desired. Gimjang is the traditional process of preparing kimchi. One little post about my fast and loose fermented cabbage spawned a stream of comments from some good friends, one who is half Korean and one who lived in Korea for several years. I thought I'd share what I learned. Thanks for the culinary lessons, guys. I love learning new things! There's a Korean saying: "There are as many types of gimchi as there are holes in the ground." Reason being that that's how gimchi/kimchi is traditionally made. Jess informed me that traditional kimchi is made in fall, left in kimchi pots in the ground for several months during winter, to ferment naturally. Although most Koreans now, she wrote, have special "kimchi refrigerators" - sort of like wine fridges - that keep the kimchi at the right temperature until it's ready in spring. Wow. And Kathey told me that she uses ground apple to cut down on the sugar. 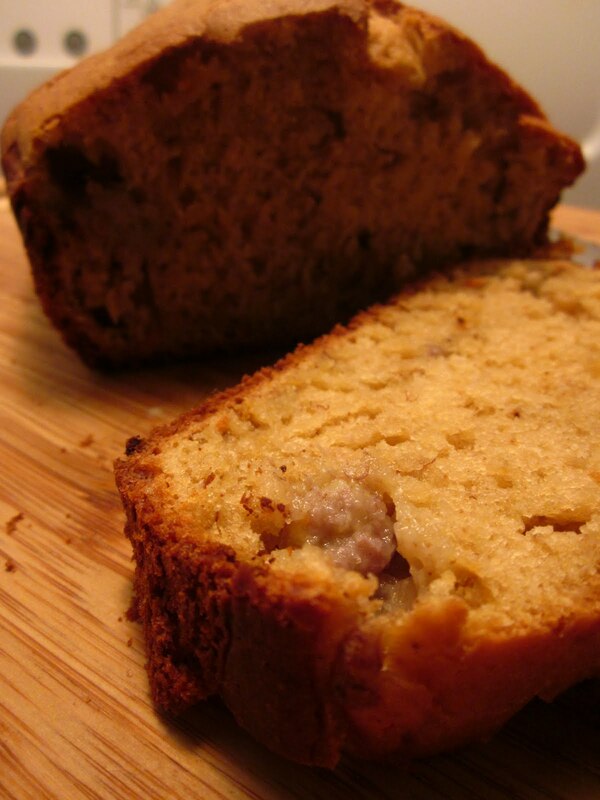 If I like this recipe, I'll have to experiment with the apple as a sweetener. Here's what wikipedia has to offer on the subject. So, my version of fermented cabbage may be the furthest possible process from authentic gimjang, but I hope it tastes good. We'll see in a few days. I dare not call this kimchi for fear of offending my Korean friends. Let's just call it 'kimchi-style.' I've received several heads of cabbage in my CSA box over the past couple of weeks and was looking for something new to do with them. Last week I made a purple cabbage coleslaw. Tonight I decided to try a fermented cabbage. I started with a kimchi recipe by Gabi Moskowitz, the BrokeAss Gourmet...and immediately made some adjustments based on what I had in my cupboard. I haven't actually gotten to the final stages, or the enjoyment part, but I'll keep you posted on the results. In a very large mixing bowl dissolve the salt in warm water. Submerge the cabbage into the salt water and weigh it down with a plate, so it stays submerged. Let cabbage soak and soften in the brine for 2 hours. A few minutes before the cabbage finishes soaking, combine the minced garlic, Korean chili paste, vinegar, and honey in a large bowl. Stir well to combine. Once the cabbage has finished soaking, drain, rinse it and squeeze it gently to remove excess liquid. Use your hands (or tongs instead if you have any open cuts as the chilies and garlic can sting) to thoroughly incorporate the chili mixture with the cabbage. 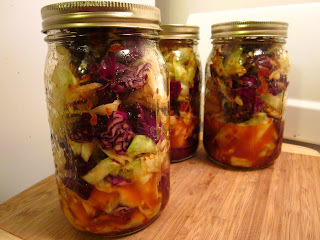 Pack the kimchi into a clean jar - or a few jars - and screw the lid on tightly. Keep in a cool, dry place, out of direct sunlight (my pantry worked well for this) for 3-4 days. After 3 days, open the jar and look for tiny bubbles. If it’s begun to bubble, it’s ready to serve or to be refrigerated. If it hasn’t yet begun to bubble, leave it for another day. 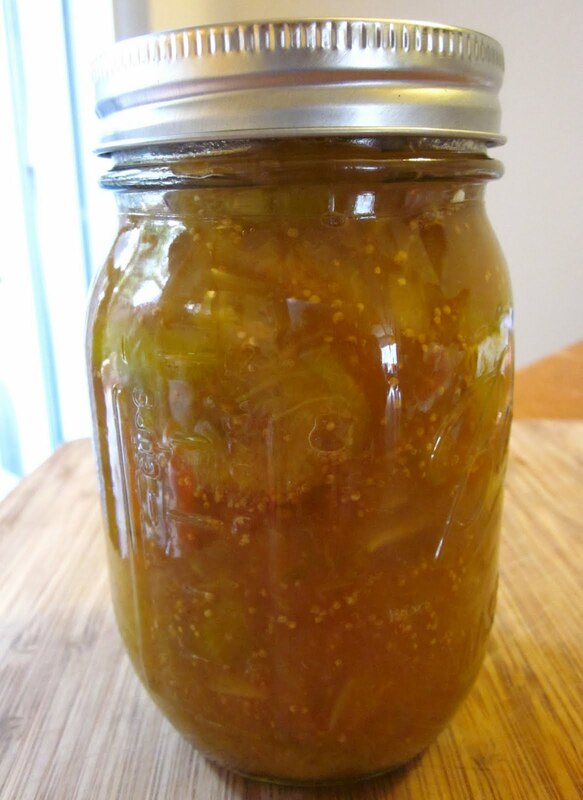 After 4 days, you should notice a few tiny bubbles throughout the jar and can either serve your kimchi or put it in the refrigerator. The kimchi will continue to ferment in your refrigerator and should be consumed within a month. Why mess with a good thing? 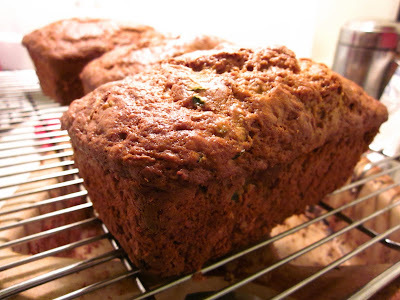 I decided to use the same recipe, or process, substituting ripe smashed bananas for the shredded zucchini to make this moist banana bread. It's just as delicious as it is easy. I did add some molasses for added flavor. Preheat oven to 375 degrees. Whisk together all wet ingredients. Mix all dry ingredients. Mix until just moistened. Stir in chocolate chips. Spoon into a prepared pan. Bake until golden brown (approximately an hour) and a toothpick inserted in the middle comes out clean. Cool in pan for 10 minutes. Then invert onto a wire rack and cool completely. I've recently been quite smitten with the tetras of coconut milk at Trader Joe's. I've never been a big milk drinker, but a chilled glass of this stuff is delightful. And, in baking, it imparts an added moistness. Preheat oven to 375 degrees. Whisk together all wet ingredients. Mix all dry ingredients. Mix until just moistened. 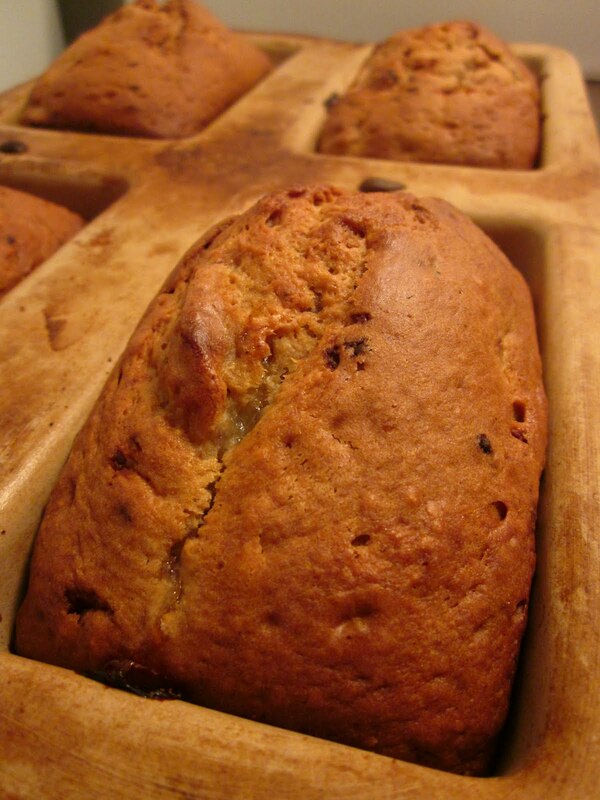 Spoon into a prepared loaf pans. Bake until golden brown (approximately an hour) and a toothpick inserted in the middle comes out clean. Cool in pan for 10 minutes. Then invert onto a wire rack and cool completely. 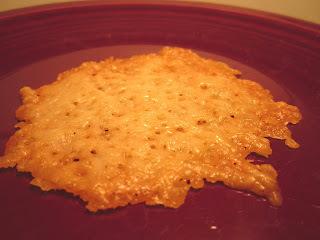 These are so easy and a nice departure from a tortilla chip. 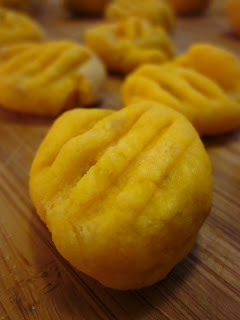 I love these with a zippy salsa. Preheat oven to 400 degrees F. Spoon a heaping tablespoon of parmesan cheese onto a parchment lined baking sheet and lightly pat down. Repeat, spacing the spoonfuls about a 1/2 inch apart. 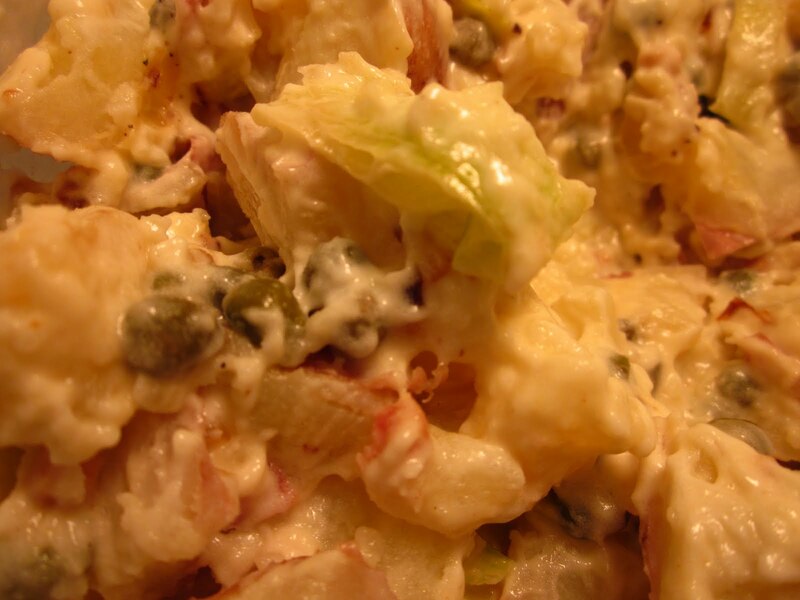 This is a flavorful sidedish that complements any summer barbeque. I used the potatoes I had just gotten in my CSA box, cubing - skins on - and boiling them till fork-tender. While the potatoes cooked, I caramelized leek coins and pancetta in a splash of olive oil. Then I tossed those two together with capers, mayonnaise, mustard (in this case I had hot and sweet mustard from Trader Joe's) and seasoned it all with pink Himalaya salt and freshy ground pepper. Delicious! 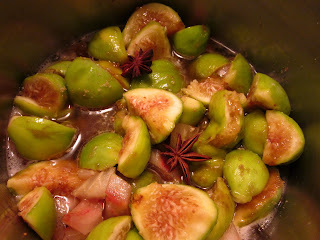 Make this the day before you serve it so that the flavors have time to develop. Because I was stuffed from our dinner, I didn't try all of the s'more combinations. Both Pia and Jenn thoroughly enjoyed the Funky Monkey S'more: graham crackers, roasted marshmallow, dark chocolate, and slices of fresh banana. 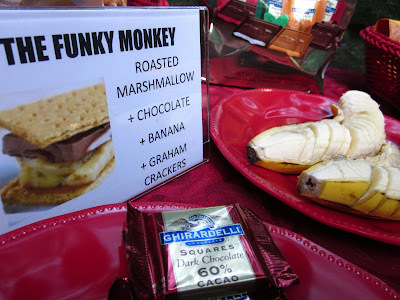 Ever the culinary adventurer, I wanted to offer the gang a few s'more flavors that were a bit more exotic than honey graham crackers and plain chocolate. I love the bite of ginger, so here are some Snappy S'mores: roasted marshmallow with a square of dark chocolate and caramel sandwiched between two ginger snaps. Yum! 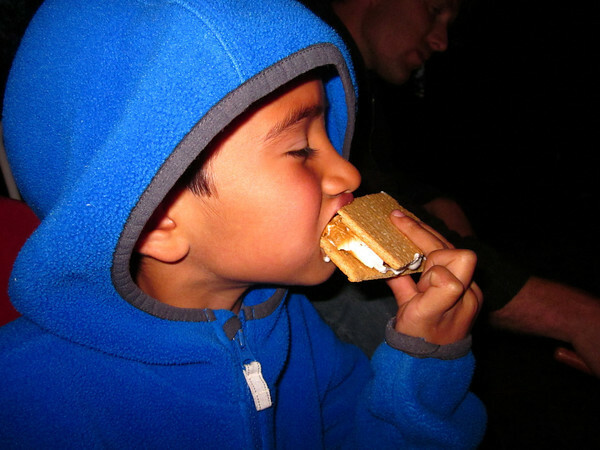 Despite my usual Nazi-esque attitude about my boys eating refined sugar, s'mores are a camping staple in my family. Dylan gets very grumpy if we neglect to make s'mores on a camping trip. 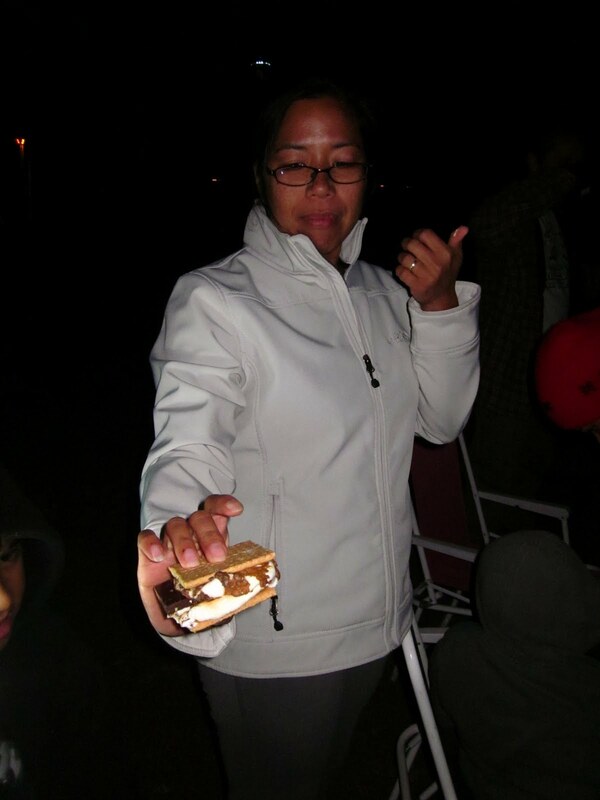 So, in planning my 20th high school reunion camping trip, I decided to set up a s'mores bar for our first night around the campfire. I debated: the standard or some gourmet choices. 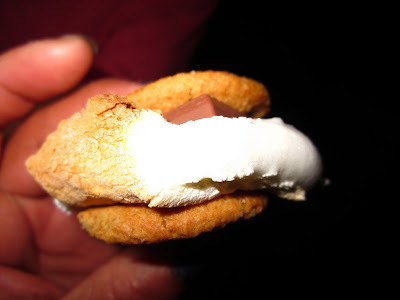 Serendipitously yesterday was National S'mores Day. Click here to read my tirade about American National Food Holidays. I write 'serendipitously' because it meant lots and lots of creative recipes to tweak this camping favorite. 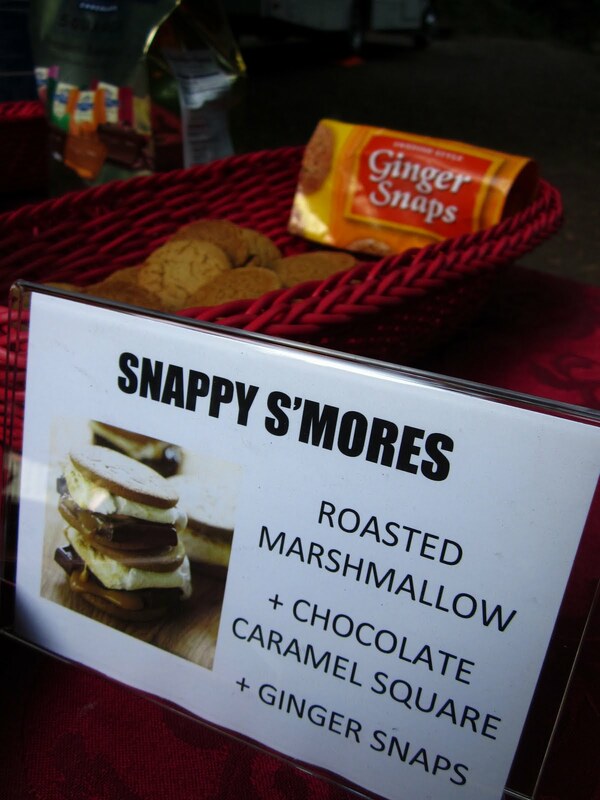 I will, of course, offer the plain jane s'mores variety; but there will be ingredients on hand for Snappy S'mores and the Funky Monkey. Recipes and photos to follow. I decided the make some zucchini bread for the first day of school. This is so easy and just as tasty cold as it is warm. My favorite gelateria in Rome is owned by a man we lovingly dubbed the Gelato Nazi. Like the infamous Soup Nazi in New York, this man would banish you to the end of the line if the combination of flavors you ordered wasn't up to his liking. Tonight we picked up some pints of Ciao Bella at the grocery store. The Blackberry-Cabernet sorbet paired very well with the Belgian Chocolate gelato. Che squisito! When I make my own gelato...here's where I start.